On a recent trip to Italy, I visited the Archaeological Area of Minturnae, a little-known but impressive archaeological site along the Appian Way. Minturnae was originally an Auruncian city (of which no archaeological traces have been found), one of the three towns of the Aurunci which allied themselves with the Samnites and made war against Rome in 314 BC. After being defeated by Rome the city suffered severe repression and was burned to the ground. The Romans settled in the area and built a castrum along the river Liris after realising the strategic and commercial importance of its close location to the sea. The military settlement grew into a Roman colony in 296 BC and became an important trading port of the Mediterranean as well as a fortified commercial centre along the Appian Way. In the 1st century BC Minturnae was a flourishing city provided with a Capitolium (temple dedicated to the triad of Jupiter, Juno and Minerva), a forum and a theatre. 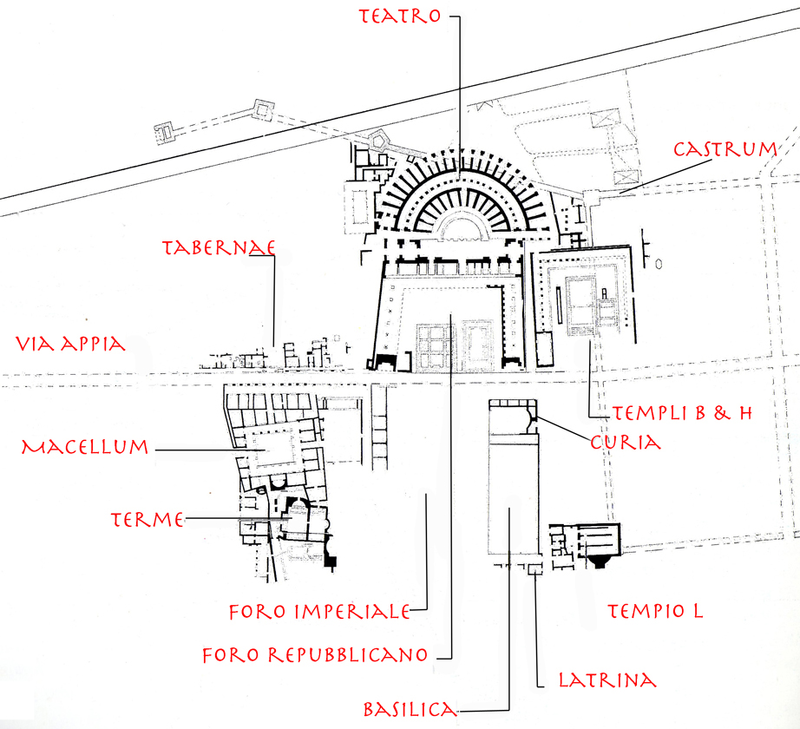 During the Imperial era a new forum was built, surrounded by public buildings such as a Basilica, thermal baths, an amphitheatre and a macellum (market). Today there are still significant Roman remains scattered on both sides of the Appian Way. On one side of the ancient road one finds the ancient theatre, the Republican forum, the Capitolium and the temple of Augustus. The theatre, built during the reign of Augustus, had a capacity of 4,500. It underwent several restorations and reconstructions, the latest of which is thought to date to the 4th century AD. Statues from the scaenae frons have been recovered including one of Augustus and another of Livia. They are on display in the Antiquarium inside the theatre. The Capitolium was an Etrusco-Italic type temple with three separate cella which was built soon after BC 191. It is located in the southern part of the Republican Forum and borders the Via Appia. On the other side of the Appian Way were the macellum (market), behind which was a large bathing complex, and the tabernae (room shops). Recent excavations have also revealed the Imperial forum which includes the Basilica, the Curia and the public latrines. The macellum was the emporium of the city where local and imported food poured into the nearby port. The building dates from the Hadrianic period with subsequent intervention during the Antonine era. The bath complex developped behind the macellum. The examination of the building techniques let archaeologists think that the thermae may have been built during the reign of Hadrian. We can clearly see the caldarium and the tepidarium as well as the natatio (swimming pool) divided into two baths. Opposite the Republican forum lays the Imperial forum. It is a big square paved in Coreno stone. On the eastern side of the forum stood the most representative buildings of the public life of the settlement: the Curia and the Basilica. The Basilica was built during the reign of Hadrian. A remarkable exhibition of archaeological materials, stone inscriptions and statues can also be seen in the Museum inside the ancient theatre. Just outside the archaeological site, visitors can marvel at the 150 majestic arches of the very fine aqueduct. It was built between the end of the Republic and the beginning of the Empire in opus reticulatum. The aqueduct entered the city at the west gate bringing water from the Monti Aurunci 11 km away. 3D reconstructions of the buildings of Minturnae done by the Istituto Tecnico Statale Costruzioni, Ambiente e Territorio Geometri di Formia can be seen online (website). Further images of Minturnae can be viewed from my image collection on Flickr. Fascinating. Never heard of this. We visited last year in September and were amazed – mini Pompeii without the crowds, just the five of us and our guide. We absolutely loved it and will definitely be going back. This looks amazing! Could you please tell me how to get there? I’ve walked up Via Appia from Capo di Bovi to the road that leads to the Hippodrome, I was wanting to see Torre Selce but never did find it. Is this past there, past milestone 7? kilometer 156 – I guess I won’t be walking – lol!